Geisinger integrated health services had a monumental task before it — create several original articles for its Report on Philanthropy, many that needed technical and scientific wording and details. accent was brought in, and we followed our well-established formula to tackle each unique article. The first step to creating compelling copy is you. accent listened to Geisinger’s needs and wants – what it wanted to achieve and how it needed its message to sound. We discussed the whole project, from developing the right tone to its overall goal. We compiled research for each article, such as the organizations mentioned, facts that were noted and people we needed to interview. We scoured periodicals, journals, the internet, previous interviews and related background — if it was out there, we found it — and used the most up-to-date, accurate information to add dimension to each article. Geisinger’s report required countless interviews, health-heavy information and many complex terms that needed real-world translations, and we kept it all meticulously filed for easy recall. It was time to see the big picture. We took Geisinger’s information apart to find the freshest angles while making sure complex or cutting-edge topics or industry-specific terms were accessible for maximum reach. 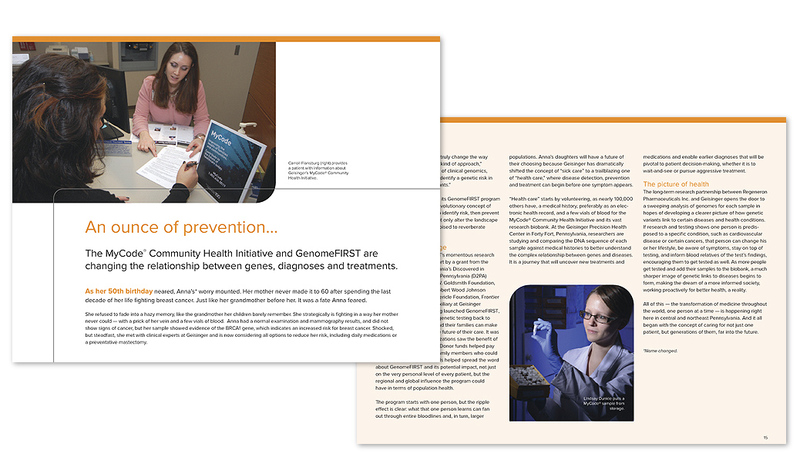 We applied our method to two innovative topics — Geisinger’s expansion of a health record information portal and its program that uses genome sequencing to prevent and treat disease. Our research shaped our angles and interview questions, and we made each article’s language relatable and their tones complementary to their topics. These became articles of reference for readers, users, patients and potential donors. Our diligent research and detailed preparation ladders up to our interviews. For Geisinger, we spoke to scientists, doctors, nurses, administrators, patients and donors to capture each topic’s immediacy and importance. We worked with each interviewee’s comfort level and time constraints, chatting via phone or email. We prepared questions and backgrounds in advance, taking into consideration if being interviewed is an everyday part of a person’s job or a special task. We make everyone we interview comfortable with the process — whether it is the company president or one of its clients. Every step leads to each article coming alive with detail, color and commentary. From tone to word choice, it all reflected how Geisinger wanted to speak to its audience. We organized each article so it was meaningful, entertaining and informative, full of relatable language, searchable phrases and compelling stories. We crafted eye-catching headlines and brought it all together in a united voice and vision. clean design was our goal. We wanted readers and users to feel how special Geisinger was, to see its progressive science and medicine, and to know how much it cares about its patients and practices. We made sure our articles worked with the headlines, photos, layouts and designs — a team effort at accent that is second nature to us —to create a final product that could be looked to again and again.